The Chabad Community Seder will take place on the first night of Passover, Friday, April 19th. Join us at our exceptional Seder! Exceptional cuisine, high-end wines, a warm community, a memorable experience! 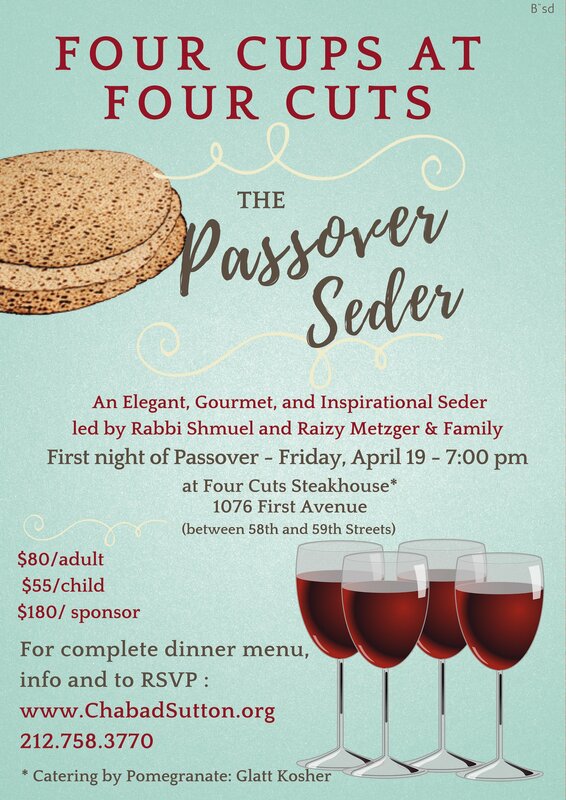 Don't miss this Seder! Therefore, all chametz that will not be eaten or burned before Pesach and all chametz utensils that will not be thoroughly cleaned by then should be stored. The storage area should be locked or taped shut to be leased to the non-Jew at the time of the chametz sale. Since there are many legal intricacies in this sale, only a competent rabbi should be entrusted with its execution. The rabbi acts as our agent both to sell the chametz to the non-Jew on the morning before Pesach starts and also to buy it back the evening after Pesach ends. To learn more about about the search and removal of chametz, click here . All Chametz must be sold by Thursday, April 18, 5:00pm. Wishing all of our friends and neighbors a Kosher and Happy Passover! 7:06 pm at Four Cuts- 1076 First Ave.
7:00 pm at Four Cuts- 1076 First Ave.
*Please wait one hour before eating Chametz. *Please note that all events and services will take place at Chabad unless otherwise noted. *It is a special mitzvah to have hand made Shmura Matzah for the Seder. The cost is $15.00 per pound. If you would like to order, please call the office at 212.758.3770.